Tommy Simpson or Tom Simpson or Thomas Simpson (30 Nov 1937 � 13 Jul 1967) was born in Durham but moved to Harworth at the age of 13 when his parents began to run the Harworth Working Mens Club. He was always on his bike and was a member of the Harworth and District Cycling Club and his first job was delivering groceries by bike locally. Then at 17 he joined the Scala Wheelers in Rotherham and got his first job after leaving school as an apprentice draughtsman at an engineering company in Retford. He enjoyed all disciplines of cycling and in May 1955 he won the National Cyclists' Union South Yorkshire individual pursuit track event as a junior. Later that year he also won the British League of Racing Cyclists (BLRC) junior hill climb championship and even more impressively came 3rd with the seniors. He won a bronze medal for track cycling at the 1956 Summer Olympics and a silver at the 1958 British Empire and Commonwealth Games. In 1959 he signed to the French professional road-racing team St. Rapha�l-G�miniani-Dunlop and won the 1961 Tour of Flanders. He then joined Gitane-Leroux-Dunlop; and in the 1962 Tour de France he became the first British rider to wear the yellow jersey, finishing sixth overall. In 1965 he became Britain's 1st world road race champion and won the Giro di Lombardia. This catapulted Simpson to the BBC Sports Personality of the Year - the first ever cyclist to win the award. 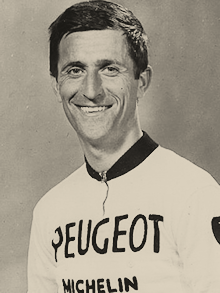 In the thirteenth stage of the 1967 Tour de France, Simpson collapsed and died during the ascent of Mont Ventoux.